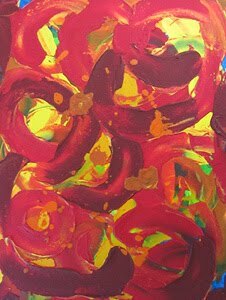 Use abstract painting as art therapy. 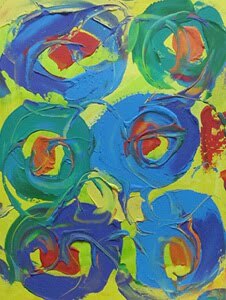 Many things can be expressed with color and brush movement across a canvas like loss, anxiety, depression and anger. 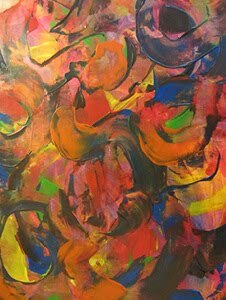 An abstract that you've painted tells your story and with continued painting you can move towards acceptance and even happiness again. 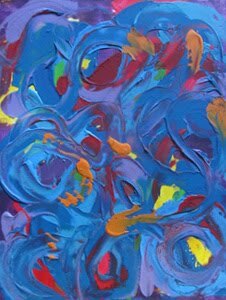 Try original abstract painting when you have trouble expressing yourself with words, because a picture does paint a thousand words. So if something has been bothering you, paint it out on canvas. When you find yourself using dark colors and jarring brush stokes in the modern contemporary abstracts you’ve painted you don’t have to recognize the image to see the pain behind it. This revelation and recognition of your state of mind will move you towards the release of those negative feelings. The physical aspect of abstract painting is healing too, so I like use big canvases to paint on when I’m upset and I move the colors around aggressively on the surface. Your brush movement across the canvas and the color choices you make will change as you progress on to the next series of canvases. With abstract wall hangings you can see the healing happening right in front of you. 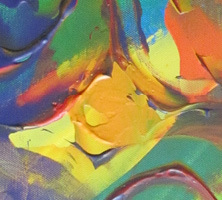 Sunset and Shadows shown above is a textured acrylic in blue, red, green, orange and yellow. 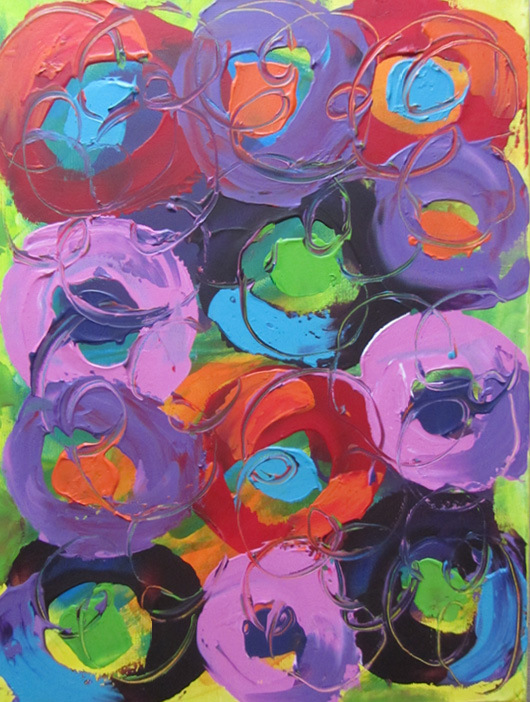 Paint was applied thickly in dramatic swirls and loops in this modern abstract. A blazing sunset in the sky contrasts with the dark mountains below much like my state of mind. This original wall hanging measures 18" x 24". Paint abstracts as if you’re a child. Children don’t get discouraged if a painting doesn’t look perfect. 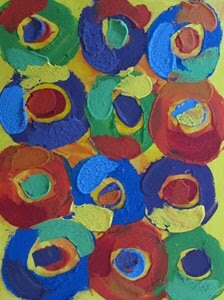 Use bold colors, try different painting tools, paint on big canvases (so have many canvases ready for this experiment) and soon you’ll see a colorful abstract masterpiece you like. There is no wrong approach to abstract painting. The only bad abstract paintings are the ones left in your mind and not on the canvas. 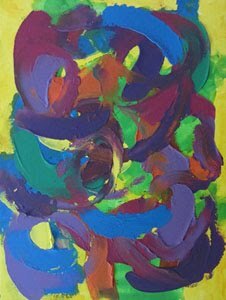 Dare to take chances with bold colors, blending colors, contrasting colors, textures, brush movement, shapes and paint layering in your modern abstracts. 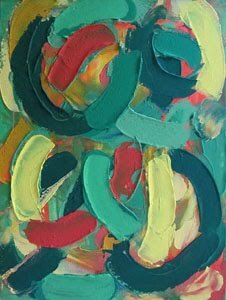 When creating contemporary abstract art there’s nothing wrong with pouring your favorite colors on canvas and moving the canvas around until all the colors collide, or putting your hands in the paints for some finger painting. Next lift away paint in sections to reveal the colors below if it seems right for your abstract wall hanging. As a child you assumed all your artwork would be a success and if it wasn't you moved on quickly to make another artistic masterpiece. That’s what abstract painting teaches adults. You learn to make decisions in the moment, it’s instinctual and feels right. It’s a wonderful and freeing way to learn anything. 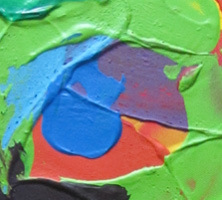 The abstract painting Lollipops shown above is a textured acrylic in red, purple, pink, orange, blue and green. 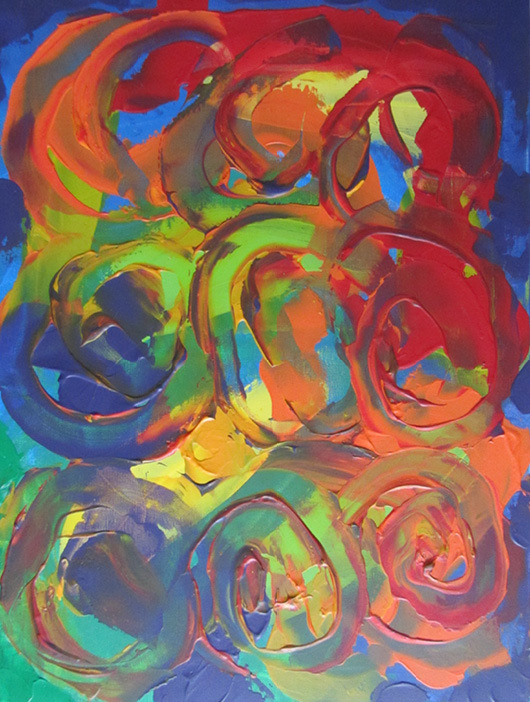 Paint was applied thickly in swirls and loops in this modern abstract. Colorful lollipops sit on display in the candy store window tempting all the kids, and some of the grown ups with a sweet tooth. This original wall hanging measures 18" x 24". Love or Hate Abstract Art? 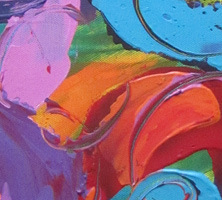 Abstract paintings are for everyone. Some abstract canvases will appeal to you more than others, but people mistakenly think that if they didn’t like an abstract painting they’ve seen hanging in an art gallery, they must hate all abstracts. 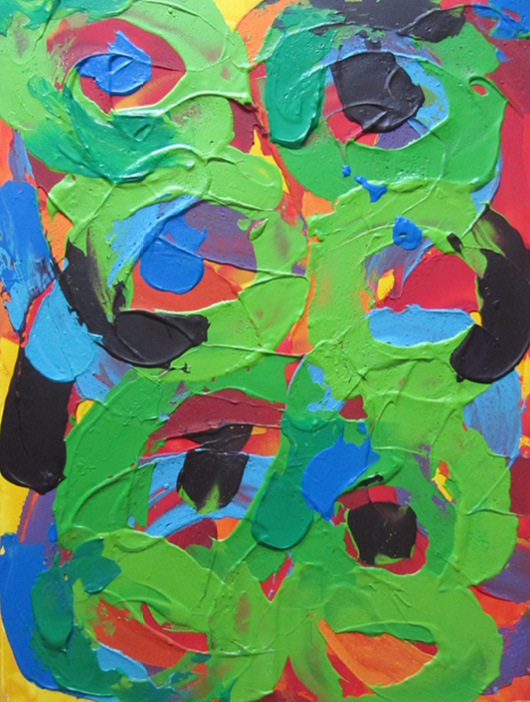 The beauty of modern abstract paintings is that you can interpret them. 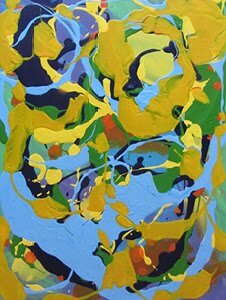 Abstracts can have deep meaning, or just be about the color and brush movement on canvas that appeals to you. With modern canvases you don’t have to have an art degree to know what you like. If you feel revitalized and rejuvenated when you look at a particular abstract wall hanging, then it has just the right combination of color, movement of brush across the canvas and texture to drawn you in. Abstracts are not only for modern contemporary spaces. The right abstracts can go anywhere to create a breathtaking focal point. You can also bring together mismatched furniture pieces with an abstract painting hanging nearby, or update underwhelming and neutral decor by using an abstract to make the space pop with color. 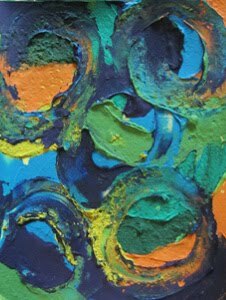 The abstract painting Sunlight Through the Trees shown above is a textured acrylic in green, blue, red, orange and yellow. Paint was applied thickly in this modern abstract where sunlight bleeds through the trees’ thick foliage casting a glow around the trees. This original wall hanging measures 18” x 24”.